You probably don’t take a container of milk or creamer with you wherever you go, but if you are a coffee (or tea) lover you will probably encounter coffee-drinking opportunities on a regular basis. Sure, it is easy to get the drink you want at a coffee shop, but it isn’t so easy at a fast food joint or restaurant that only offers tiny half-n-half containers alongside that steaming mug of freshly brewed coffee. I will drink my coffee black if there are no good cream options (actually, I drink it black most of the time if the coffee is good), but I find the Xtra Cream Container very appealing all the same. 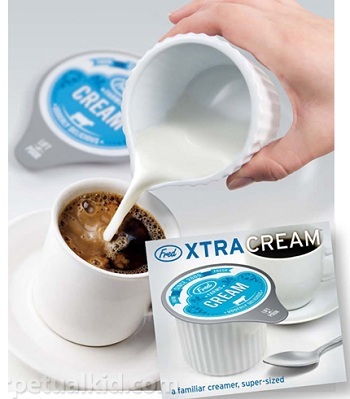 The container is like a super-sized creamer – and it actually holds more than 2 teaspoons of liquid. It has a resealable lid and travels well, so you can take the dairy or nondairy of your choice with you and will always be prepared to take your coffee as you like it. And, to be honest, it also makes a neat candy dish for the desktop of a coffee loving friend. I have yet to meet a coffee drinker who hasn’t at least cracked a little smile after seeing it!